This update installs new firmware on PowerBook and Xserve Combo drives. The update prevents Combo drives from intermittently failing to eject discs. It's recommended that you install this update to ensure that your Combo drive avoids this problem. IMPORTANT: If you are currently unable to eject a disc from your drive, you can't use the update application to update your drive firmware. If you have tried all methods of ejecting discs as described in your user manual, you may need to contact AppleCare for service. Consult the documentation that came with your computer for support information. This update is for Xserve servers and PowerBook computers with an internal slot-loading Combo drive. For more information, see Apple Knowledge Base Document 120212. MacSpeedZone's David Engstrom has posted a benchmark comparo of the new 14" iBook 900 and the 12" PowerBook G4/867. ...both portables are fairly evenly matched. In standard processing work the iBook is slightly ahead, however in game performance the PowerBook, with its more robust graphics card, pulls ahead . . . but not dramatically so. The difference in drive performance is nil, and in window redraws both 'Books' came out the same. But in applications tuned for the PowerBook's G4 processor, it is a different story. Here the PowerBook, though clocked slower, and with half the amount of high-speed L2 cache, came out on top . . . sometimes way on top. ...If you make heavy use of QuickTime, iMovie, Final Cut Pro . . . don't waste your time on a G3. At $300 more the PowerBook is well worth the extra brass. On the other hand, if you are not a heavy user of AltiVec-optimized applications, it's hard to make a compelling case for shelling out the extra bucks for the PowerBook over the iBook on the basis of speed, although there are other considerations that may make the PowerBook more desirable. However, the iBook is cheaper, runs cooler, and goes a lot longer between battery recharges. David Engstrom notes: "In battery life we were able to eke out 50% more uptime on the iBook (despite its bigger screen), when both portables were under similar load configurations." The TouchStream Mac NTouch Keyboard is a revolutionary add-in product for the 15" PowerBook G4 that integrates the functions of a large-area super touch pad, a multi-hand, gesture input command station, and a Zero Force keyboard, all on the same smooth surface. The Mac NTouch's non-mechanical Zero Force keys require only the lightest touch, make no sound, and can be moved around to suit the needs of the individual user. Users of the Mac NTouch Keyboard will never have to move their hands between the Zero Force keys and the pointing device, since the "mouse" is always under their fingertips. The most exciting and revolutionary aspect of the Mac NTouch Keyboard, however, is its ability to interpret the touching and movement of both hands to quickly and effortlessly enter commands normally done by typing hot keys or by mouse pointing and clicking. The Mac NTouch Keyboard has a large number of built-in gestures for doing picture, text, and image editing, file operations, and web browsing. These gestures are used to do commonly executed operations like opening and closing files, cutting and pasting text, and zooming and rotating objects. They are quick to use and easy to remember. But what really makes the Mac NTouch's gesture input powerful is the ability for each user to create customized gestures using our free MyGesture Editor. This means that you can create gesture sets that perfectly match the needs of your favorite applications. The Mac NTouch Keyboard is designed to be a drop-in replacement for the existing 15" PowerBook mechanical keyboard. The PowerBook's existing keyboard easily lifts out and the Mac NTouch drops in - all in about 2 minutes. No software drivers are needed to start using the Mac NTouch immediately. The Mac NTouch 's large surface is more than big enough for full-range pointing, touch-typing, and gesture input. The Mac NTouch 's Zero-Force key layout is split to provide a relaxing and stress-reduced posture for both hands and body. The Mac NTouch is only available with a QWERTY layout. You bought the most gorgeous laptop ever made, now how do you carry it? Spire has heard your desperate cries for help and responded. The new 2003 Flux is the perfect solution for holding your 17" PowerBook. 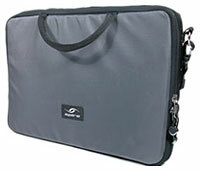 The Flux offers incredible protection at a value price, and it's made to fit the 17" PowerBook like a glove. The first thing you will notice about the Sumdex iShuttle is its enticing design and a shape that is sure to attract attention. This water-resistant and durable EVA case comes in five delectable colors: blueberry, tangerine, graphite, lime, and indigo. 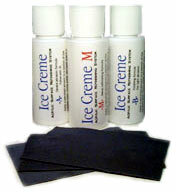 Ice Creme allows you to easily remove the scuffing, scratching, and abrasion that tends to occur on highly polished acrylic panels, such as those used in several consumer devices and popular computers. Products like the iPod, iBook, PDAs, and cell phones can all benefit from the ease of use and power of Ice Creme, which makes scuffed-up plastic products gleam like new. Great when you want to spruce up or sell your gear. The regular formula is for plastic products. The "M" version contains an additional bottle of metal polish for products like the iPod's polished metal back panel. Both versions include special application and polishing cloths. Two part formula removes even aggressive damage. "M" version removes damage from iPod's metal back pan. Enough to repair several units. Includes application and polishing cloths. Convert your existing G3 Micro-Adapter to work with the PowerBook G4 with this handy and economical device. This product works only with Apple brand PowerBook adapters. $17.95. Thick foam padding protects your iBook from accidental bumps - from $19.95. Ready for a trip? If you're going to be mobile, even moving around the office for meetings - a spare battery adds a whole new meaning to the word portable. Each extra battery can add up to 5 hours of life to your 15" G4 PowerBook. $126.95. These batteries are the ideal spare or replacement battery for your G3 Lombard or Pismo PowerBook. $147.95. These batteries are the ideal spare or replacement battery for your G3 WallStreet PowerBook. $147.95. For more information, visit DevDepot. Plextor Corporation has announced the new PX-504UF DVD+R/RW drive. The external DVD/CD burner delivers fast 4x DVD+R Writing, 2.4x DVD+RW Rewriting, and 12x max DVD-Reading; the versatile 6-in-1 drive also supports 16x CD Writing, 10x CD-Rewriting, and 40x CD-Reading. The PX-504UF DVD+R/RW drive features Plextor's first dual interface to support both Hi-Speed USB 2.0 and full-speed compliant IEEE-1394 FireWire for high-speed data transfer. Now PlexWriter customers can easily share a single DVD/CD recorder among multiple Apple Macintosh and Microsoft Windows-based personal computer systems. The new Plextor drive also bundles a package of premium digital media software from Roxio, including Easy CD Creator 5.3 DVD Edition, and PhotoSuite 5 SE and Toast 5 Lite. "Many of the people who purchase PlexWriter drives also use Apple Macintosh computers, and we want them to be able to take advantage of the performance and convenience of FireWire connectivity," said Howard Wing, vice president of sales and marketing for Plextor. "It's not uncommon for a single household to have both Windows PCs and Apple Macintoshes. With the new PX-504UF, Mom and Dad can use the PlexWriter drive on the Windows PC to backup work data to a CD, and then five minutes later the kids can use the exact same external drive to play a DVD on the Macintosh in their room." The Plextor PX-504UF is a highly versatile DVD/CD burner specifically designed to deliver high-quality recording performance. The drive gives users the ability to create, edit, and share customized DVDs and CDs using video, photos, audio, and data. Users can use the Roxio applications to back up and archive up to 4.7 GB on a single-sided Recordable DVD disc and create photo albums for viewing with DVD players. Lossless-linking technology enables users to perform basic editing tasks directly on the DVD disc, so there is no need to reload DVD content back to a PC to make minor changes - and no need to re-burn an entire DVD after making small edits. The unit features a 2 MB data buffer and burst data transfer rates of 5.5 MB/sec., allowing users to burn a 4.7 GB CD disc in less than fifteen minutes. Roxio Easy CD Creator 5.3 DVD Edition includes DVD Builder, Roxio's DVD authoring application that allows consumers to capture digital video, add transitions and background music, create animated menus, organize clips and photos into custom slide shows, and burn to a DVD or CD that can be played in set-top DVD players. Easy CD Creator 5.3 DVD Edition combines the power of Easy CD Creator Basic and DVD Builder into one complete, easy to use, integrated solution. Easy CD Creator 5.3 DVD Edition includes DirectCD (packet writing), CD and DVD pre-mastering, DVD video authoring, one-button CD copier, and the ability to create enhanced and mixed-mode CDs. Easy CD Creator 5.3 DVD Edition simplifies the production of DVD videos while also providing the ability to create music CDs, photo slide shows synchronized with music, data CDs and DVDs, and back up copies of personal discs. Roxio PhotoSuite 5 SE allows consumers to capture, organize, edit and share digital photos. It includes simple electronic albums and a combination of automated and advanced photo editing tools, including the ability to easily remove red eye and wrinkles, lighten or darken, crop and rotate. Consumers can also print and share online or quickly E-mail them without leaving the program. With PhotoSuite 5 SE's integrated Easy CD Creator burning technology, Plextor consumers will be able to burn photos to CD, Video CD or DVD. Roxio Toast 5 Lite is a limited version of Toast 5 Titanium, the comprehensive, all-in-one DVD and CD burner software that enables consumers to create, organize, share and store all of their digital content on CDs or DVDs. Roxio's award winning Toast DVD and CD burner software works with Mac OS X and Mac OS 9.1. The Plextor PX-504UF DVD+R/RW drive is scheduled for shipment to distributors and resellers in North and South America in June 2003. It will also be available nationwide through Best Buy stores. The PX-504UF drive has a Manufacturer's Suggested Retail Price (MSRP) of $329.00 USD. All retail packages include unlimited toll-free technical support and one-year full warranty. Reservations for the PX-504UF drive are now being accepted. Mobility Electronics, Inc., a leading provider of innovative portable computing solutions for the mobile computer user, announced today a strategic alliance with Kensington Technology Group, a personal computer accessories leader. Products from Mobility Electronics' power product line will also be sold under the well-known Kensington brand name. By combining the functionality of several power devices and compatibility with both AC and DC power sources, the Mobility Electronics' power adapter eliminates the need to carry a separate notebook AC adapter, mobile phone adapter, and/or handheld/PDA power adapters (with optional accessory). Business travelers and other mobile users can now replace bulky power packs and numerous adapters with a single power source, eliminating extra weight and jumbled power cords. The combination AC/DC power adapter is compatible with more than 600 of today's most popular notebook computers, including brands such as Dell, Hewlett Packard/Compaq, IBM, Gateway, Toshiba, Fujitsu/Siemens, and Apple.